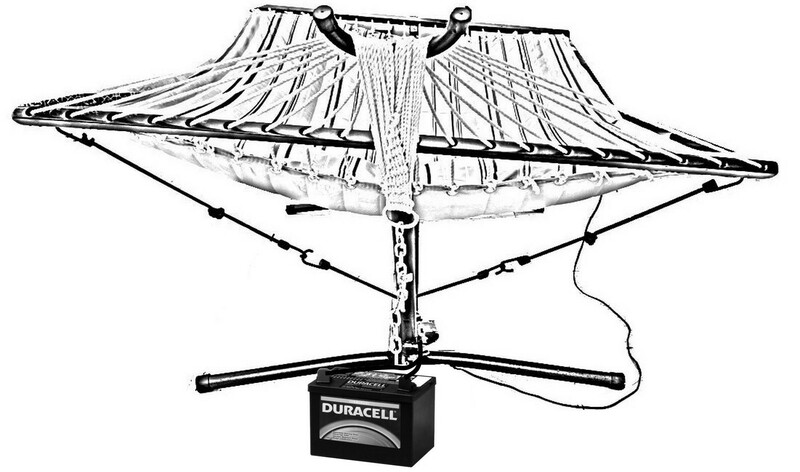 Patent Pending electric device to swing hammock back and forth. Only one of its kind! Swinging in a hammock is now made easy! Our new, patent pending device Hammock Rocker allows hammock to swing effortlessly with a single push of a button. Secret is not only in a powerful electric motor, but also in a patent pending dual use of bungee cords, which are not only create symmetrically alternating pulling force to swing hammock back and forth, but also act as a shock absorbers, to make movement more comfortable. 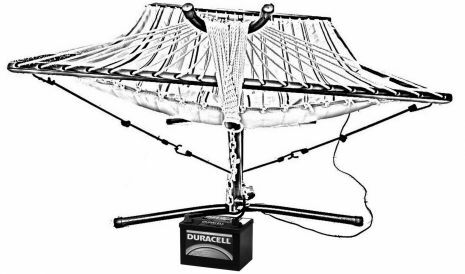 Automatic Hammock Rocker works with regular 12V battery, using provided alligator clips, or optional 12V 5A power adaptor, that is available on Amazon under $10. 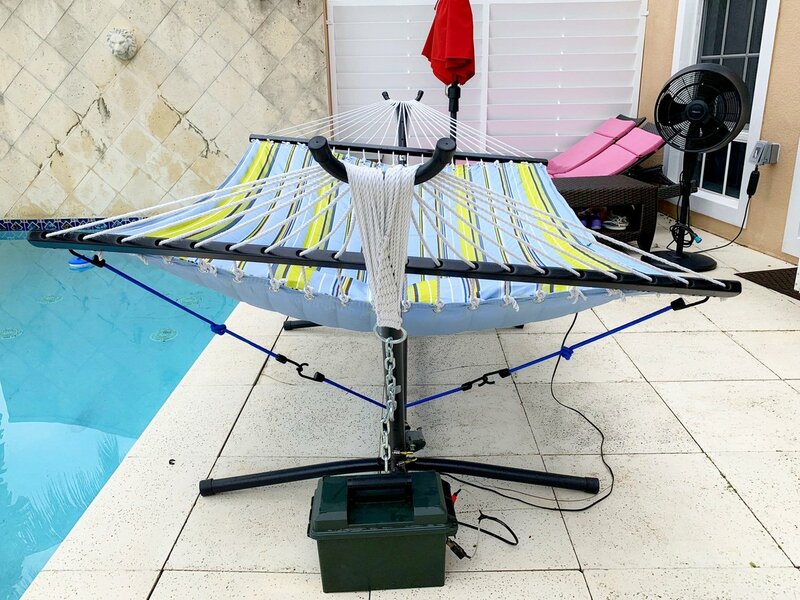 Hammock Rocker motor can be attached to hammock stand tube with provided two clamps, and best to be used with regular type of hammocks fabrics with wooden spreaders. Hammock Rocker works with most hammock stands, as long as there is place to secure it to support tube of the hammock frame, somewhere closer to the center line of the stand. BBC article: Rocking like a baby promotes better sleep in adults: "Scientists said the rocking motion resulted in a longer period of slow brainwaves which caused deep sleep, and improved their memory". Therefore, it is possible that Hammock Rocker might work for people with sleep disorders. Included: motor, 2 metal clamps, rubber cords, aligator clips to connect to 12V battery. Not Included: Hammock or hammock stand are NOT included. Battery NOT included. 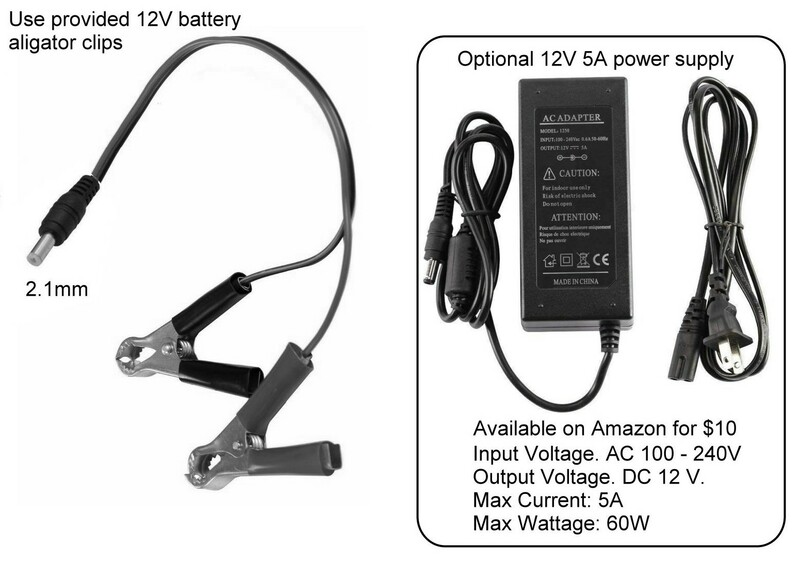 110V power adapter NOT included, but available from Amazon for about $10. Please note that Hammock Rocker was tested with various hammocks and should work as intended. We would not be selling something that does not work. If you have any questions or having trouble using this device, please contact us. While motor does produce low level noise while working, it is very easy to mask with relaxing music. Hammock fabric with wood spreader included! FREE polyester storage bag is included! Adjustable height is optimal distance from ground to hook of 37". Quick assembly of hooks is required.